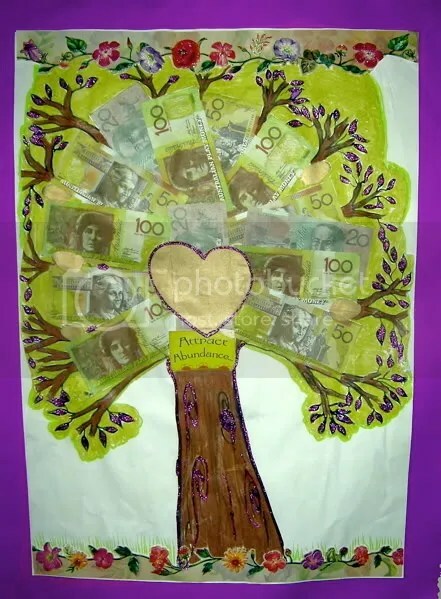 Money Does Grow on Trees…it’s called a ProsperiTree! 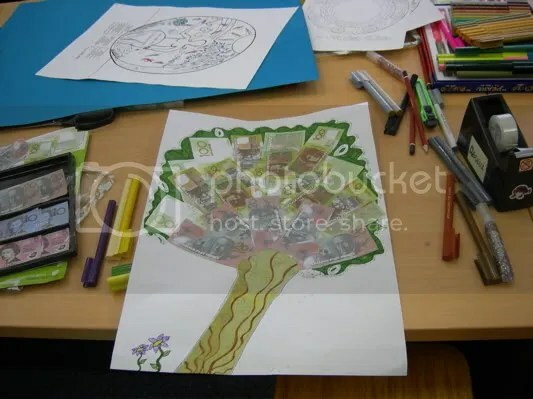 Creating Empowerment Art is a process that engages people on an auditory, kinaesthetic, visual, emotional / Spiritual level which reflects the mulitplicity of peoples preferred learning styles , whilst also relieving them from the boredom of having to sit still during workshop training. As we study the principles of “I create my reality” we create Art work that embodies the essence of the session and the art work, which I call ProsperArty, then comes to live with us in our homes, art work that embodies self-created Intent and is also a subliminal reminder of all that we discussed in the session that day. This week we looked at moving from Poverty to Prosperity. Then we fill the abundant foliage with the larger currency notes, decorate it with the Vision and intent of a brighter and more abundant path in life. Don’t we have colourful currency here in Oz? 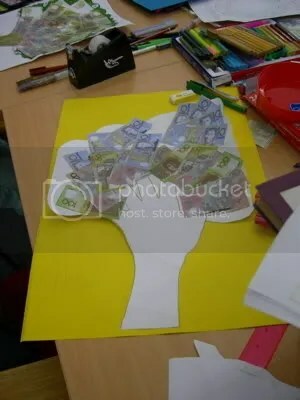 Having the ProsperiTree on the wall in the home enables the ProsperiTree Creator to get used to SEEING money and being FAMILIAR. ~FAMILY~are~with the presence of money in their life. The Law of Attraction is empowered when FEELING + ACTION are passionately engaged. Getting into the FEELING of abundance in order to overcome lack and limitation! There are many misconceptions around Money so in the between weeks of our monthly “Art of Change ~ Law of Attraction Empowerment Group”, the participants, under the skilled guidance of Deanna -Nungala, are studying The Science of Getting Rich by Wallace Wattles . Here are some of the ProsperiTree Goddesses showing the forest of new opportunities that they have ‘drawn’ into their life. Once we have had the “Wow” of new information and insight, the Law of Attraction requires us to begin to ACT as part of the co-creative process and to FEEL the feelings of how the new, wonderful things will look and feel and smell and taste. Wow!! Then HOW? Followed by NOW! Thankyou Oprah for sharing that insight on the Anniversary Collection DVD set. I thoroughly agree that once people have ‘heard the new news, it is important that they then receive the information about how. CHANGE is a full-bodied, experience and ‘drawing’ in those changes we begin to work more consciously with the Law of Attraction along with the process of time and seasons and cycles. Empowerment Art is a heart warming, creatively empowering way to develop our creativity manifestation skills that are often still embryonic by the time we reach an age of self enquiry and embark on the journey within. How did so many end up so disconnected from the magical, creative self we knew ourselves to be as children? I wrote a piece that might explain what happened to some and thankyou to those wonderful teachers who were able to ensure that the co-creative magic was not lost, whilst so many others inadvertently put out the fires of magic and possibility that burn so brightly in children. Click on the The Magical Child in Exile to read a story that might belong to you. This entry was posted on January 17, 2007 at 10.34	and is filed under Aboriginal, Art, Australia, Community, Creativity, law of attraction, Lifes Stories, Love, Magic, Mandalas, Oneness, Peace, Prosperity, Relationships, Spirituality, The Art of Change, Unity, Wealth, Wisdom. You can follow any responses to this entry through the RSS 2.0 feed. You can leave a response, or trackback from your own site. One of those trees would be nice right about now. I enjoyed your prosper-i-trees and have developed an origami lamp to help visualize a greater abundance.